While our exit from the stage is not as quick as Canada's two-time speed-skating champion Catriona Le May Doan (see 17:07), we are heading off sharpish too. the pre-tournament stories you need to know. Joe Bennett: Group D looks a bit tasty..
Phew! All over in Ottawa City. What do we think to that then? England coach Mark Sampson must be pretty happy with his team's draw. France are clearly the standout opposition, with Les Bleues ranked fourth in the world and looking to improve on their fourth-placed finish at the 2011 World Cup. Colombia, who were eliminated at the group stage four years ago, are ranked 31st in the world, while Mexico are 25th in the rankings and have not progressed past the first stage in two attempts. England are drawn in Group F alongside France, Colombia and Mexico. Yes, that's right. South Korea are placed into Group E instead of Colombia. China have been plucked out of the hat and thrown into Group A. And that means they will face hosts Canada in the opening match on 6 June in Edmonton. Fifa secretary general Jerome Valcke, the adjudicator of draw proceedings, goes through all the small-print. How many pots there are, what the draw process is, etc, etc. "I think we have said everything about this draw and I think we can start," he concludes. Right, forget scary-looking mascots. Now we're edging closer to the real business of the draw. The four people responsible for picking out the balls are being introduced to the waiting crowd. And the final 'draw assistant' is one of particular interest to Darlington, Dundee United, Wigan and Ipswich fans. Seriously. Any ideas? It is, of course, former Canada captain Jason De Vos, who spent the bulk of his career in British professional football. Lee Witney: Hope the #WomensWorldCup draw is kind to @england #Lionesses!! England are the only British nation to qualify for next summer's tournament - but have they got any hope of winning? Well, they will be drawn alongside one of the big guns in the group stage, but should fancy their chances of progressing as, at least, the second-placed team. dominated their qualifying group by winning all 10 matches and scoring 52 times, conceding just once. Their best World Cup performance is the quarter-final finish they achieved in 1995, 2007 and last time out in 2011. Eileen Cheng: Is it just me or does the mascot looks a bit scary? Katie Bulman: OMG! It's a giant dancing Owl.. Here is the dancing mascot! Shueme bounds on to the stage, alongside 20 young performers from a dance school in Ontario. Shueme's name, I'm reliable, was inspired by the French word for owl, which "pays tribute to bilingualism and Canada as an inclusive, multicultural country", according to Fifa. So for the draw, the 24 teams have been split into four pots. The six top seeds are all in pot one, with the rest of the competing nations divided into the other three pots on the basis of their continental governing body. As we outlined earlier, here's the drill. There are 24 teams which will be drawn into six groups of four. The top two teams in each group, along with the four best third-placed sides, will reach the last 16. Then, the tournament will be a straight knockout, culminating in the final on 5 July in Vancouver. Blair Nolan: Watching the draw for the #WomensWorldCup 2015. Only 6 months away. GO CANADA. Stacey: So excited for #WomensWorldCup draw!!! Here come the Royal Canadian Mounted police. Nope, they're not hauling Catriona Le May Doan off the stage for crimes against television presenting. Wearing their iconic red serge, three mounties bring the trophy out on to the stage. After the watching audience are treated to a highlights package of wonderful goals, cringeworthy misses and manic celebrations from previous World Cups, two-time Olympic speed skating gold medallist Catriona Le May Doan strides on to the stage. Fifa vice-president Jeffrey Webb: 2015 @FIFAWWC Draw in Ottawa... great ambience the excitement is building. Quiet please! It is a phrase that you often hear from museum curators across the world - and from Ricky Gervais' character in 'Night At The Museum'. In this social media-dominated world that we live in these days, it was no surprise to see signed stills of the 24 coaches being published by Fifa's official Twitter account. Alex Lopez: Ready to fill in my group brackets!! Let's go USA!! will be broadcast by the BBC. The tournament will be shown on BBC Two, BBC Three and the Red Button, while Radio 5 Live and the BBC Sport website will also offer extensive coverage. "The BBC offers a huge platform to showcase one of the largest women's sports events to a British audience," said director of Fifa TV, Niclas Ericson. 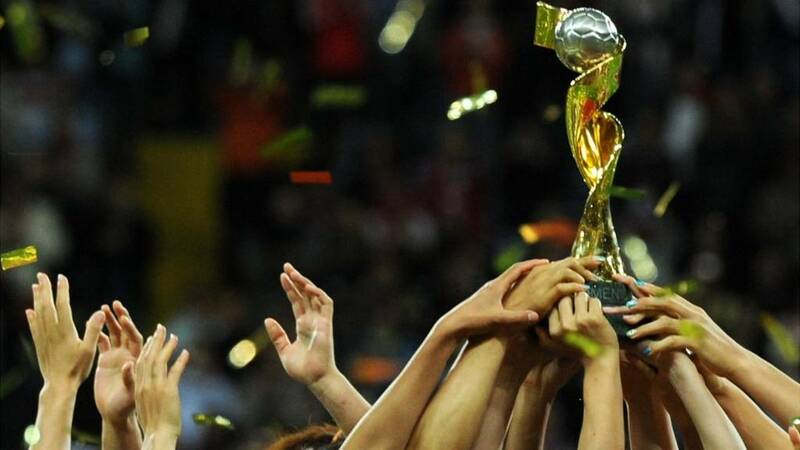 The announcement ensures it will be the most comprehensive coverage ever of a women's international football tournament and follows the BBC's coverage of the Women's Euros in 2013, regular coverage of the Women's Super League and England internationals. As well as reading along here, you can also watch all the action from Ottawa without going anywhere. How? By clicking our glitzy 'Live Coverage' tab on this page of course. The feed starts at 17:00 GMT. If you want to hazard a guess at what Shueme (that's the official mascot) is supposed to be then make sure you let me know. I also want to hear your thoughts about the football - particularly what your dream group would be for England? Your early predictions of the World Cup winners would go down a treat as well. Although if, like me, you're an avid follower of Fifa competition draws, you will know we're not going to see those egg-shaped pots for a while yet. Why rush these things when you can string it out for a full hour? From 17:00 GMT we will witness all the hallmarks of a tried and tested Fifa production over the course of 60 entertaining minutes. Spectacular video montage of the tournament to the soundtrack of powerful instrumental music? Check. Famous sporting faces eulogising about how great the host nation is? Check. Performance from a multi-lingual pop singer who shot to fame on a reality television show? Check. And the appearance of the colourful tournament mascot - which leaves everybody wondering exactly what it is supposed to be. Check. About as clear as an extra large dollop of thick Canadian maple syrup I'm sure. So let's make this crystal. Tonight, it is World Cup draw time at the Canadian Museum of History in Ottawa City. The biggest prize in women's international football. Hosted by Canada next summer. Now it is almost time to *adopts voice of National Lottery announcer man* release those balls! Over 1.2m visitors stroll through the revolving doors of the Canadian Museum of History every year, then saunter down the marble hallways while they peruse some of the North American country's most valued national treasures. If you want to learn about the birth of modern-day Canada in 1867, its official divorce from Great Britain in 1931, or the creation of the iconic Maple Leaf flag in 1965, then it is the place to be. And if you want to learn about the Fifa Women's World Cup 2015, then it is also the place to be tonight. But, if you're not in Ottawa City as a Fifa dignitary or a coach of one of the best 24 female international teams, then this is the next best place to be. To find out what is happening in the place to be. That clear?